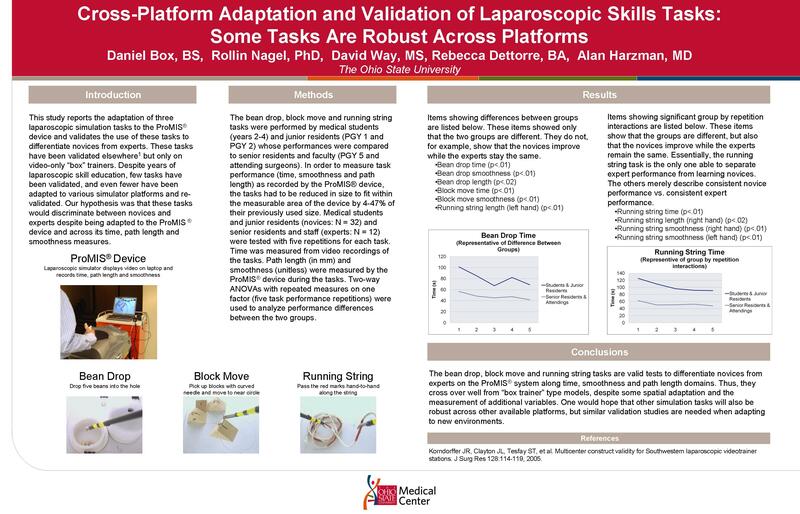 Introduction: This study reports the adaptation of three tasks to the ProMIS® device and validates the use of these laparoscopic simulation tasks to differentiate novices from experts. Despite years of laparoscopic skill education, few tasks have been validated, and even fewer have been adapted to various simulator platforms and re-validated. Methods: The bean drop, block move and running string tasks were performed by medical students (years 2-4) and junior residents (PGY 1 and PGY 2) whose performance was compared to senior residents and faculty (PGY 5 and attending surgeons). In order to measure task performance (time, smoothness and path length) as recorded by the ProMIS® device, the tasks had to be reduced in size to fit within the measurable area of the device by 4-47% of their previously used size. Medical students and junior residents (novices: N = 32) and senior residents and staff (experts: N = 12) were tested with five repetitions for each task. Time was measured from video recordings of the tasks. Path length (in cm) and smoothness (unitless) were measured by the ProMIS® device during the tasks. Two-way ANOVAs with repeated measures on one factor (5 task performance repetitions) were used to analyze performance differences between the two groups. Results: Significant differences between the two groups were noted for all task measures across the five repetitions (p<.02), except for path length on two of the tasks. Bean drop performance differences were noted between the groups for time, length and smoothness (p <.02). For the block move, between-group differences were noted for time and smoothness (p<.004). Performance across the five repetitions for the three measures for both bean drop and block move indicated linear improvement across repetitions (p<.01). Further analyses indicated performance improvement from baseline (p<.02) by the third repetition, if not before, for each of three measures for these tasks. There was also continued performance improvement (p<.04) through the fifth repetition for each of these measures. A significant group by repetition interaction (p<.02) was indicated for each running string measure except for left hand path length which had group (p<.002) and repetition (p<.001) differences only. For each of these significant interactions in the running string, the experts out-performed (p<.001) the novices at each repetition except for right hand path length with only baseline group differences (p<.04); by the third and continuing through the fifth repetition, novices performed better than their baseline score while the experts demonstrated no practice improvement across repetitions. Conclusions: The bean drop, block move and running string tasks are valid tests to differentiate novices from experts on the ProMIS® system along time, smoothness and path length domains. Thus, they cross over well from “box trainer” type models, despite some spatial adaptation and the measurement of additional variables. One would hope that other simulation tasks will also be robust across other available platforms, but similar validation studies are needed when adapting to new environments.